B.A.R.K. Meadow Stables was founded by Kerry and Billy Lord in 2017. They had a dream to own a family-friendly equestrian center. The passion grew out of her daughters’ riding lessons. Kerry Lord began taking her daughter Kiera to horseback riding lessons in 2014. Daughter Alexia was soon to follow in 2015. Billy and Kerry Lord thoroughly enjoyed watching their own girls and others interacting with and riding the horses. Kerry came up with the name B.A.R.K. by combining the first initials of family members. Kiera sketched out their logo and B.A.R.K. Meadow Stables was born! B.A.R.K Meadow Stables offers boarding, lessons, training and showing opportunities, indoor and outdoor riding rings, great horses and great people! Emily is a seasoned professional with over 20 years experience riding horses. Her main focus is eventing with a strong training in dressage. She believes a solid dressage and balanced riding is the foundation for any successful pair. Emily earned a Bachelors Degree in Equine Industry and Management from the University of New Hampshire in 2015. While attending she rode for the UNH Intercollegiate Dressage Association team. She was co-captain during her senior year, and also rode in the national championships three times. In 2016, she studied with Equissage Inc and received her certification in equine sports message therapy. A great deal of her work has been done with young or inexperienced horses. Her current mare is a Connemara X Irish Sport Horse who Emily bought as a recently saddle broke 5 year old in 2015. They have gone on to be extremely successful in beginner novice eventing. Emily focuses on creating strong communication between horse and rider to build confidence and trust—this is the foundation to any solid duo in any discipline. She teaches beginner first-time riders up to advanced intermediate riders and works with all levels of horses. Alexander Shimer is a MA licensed riding instructor who has been riding for the past 18 years. 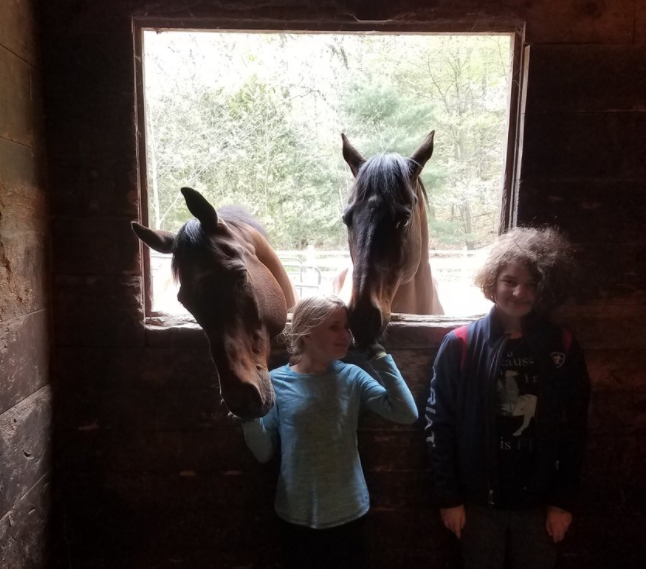 As a graduate of Essex Agricultural and Technical High School’s Equine Science program as well as the University of New Hampshire’s Equine Industry and Management program, she places emphasis on the psychology of the horse as well as the level of care necessary to proved our equine companions with the best life possible. With a background in western pleasure, hunt seat equitation, hunter/jumpers, eventing and dressage, Alexandra pulls from multiple disciplines and teaching styles to accommodate the horses and riders she works with. Olivia has been riding for thirteen years. She has competitive experience in equitation, hunters, and jumper rings. Though the majority of her training is in hunter/jumpers, she also has experience in western riding and showing. Olivia has worked with students of various levels and ages. She believes in safety and cares deeply about the growth and well-being of her students.